In usual Minnesota fashion, spring blew in on a blustery winter storm, cancelling school and coating the world white once again. My boys ran outside as soon as they could on that snow day--a bonus day added onto their spring break--and reveled in the awe of the foot of snow in the yard that just the day before was bare. But then came the rain and washed the world green and brown once again. Big puffy winter jackets traded for light sweatshirts. Snow piles a distant memory as they stomped through mud puddles and dug in the sandbox. In the midst of this was Easter. I read somewhere that Easter is becoming the new Christmas. This may be true in some families, but I try to keep ours more low-key. We sprinkle festivities through the weeks leading up to the holiday, but Easter is definitely a distant cousin to the craziness that is Christmas. 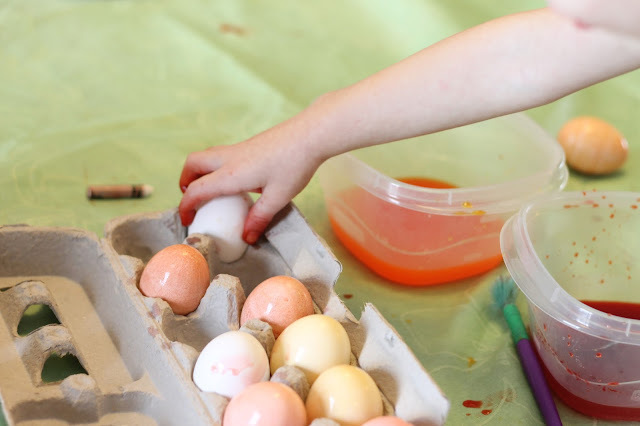 Ours looked a little like this: cookie making, frosting licking, sprinkle dumping, egg dyeing, stained fingers, homemade kool-aid dye drinking, Easter crafts, plastic egg explosions, Easter egg hunts. And, of course, the bunny mailed David a letter asking if he could, please, fill in for him at the VFW since he overbooked himself once again this year. Easter morning found us licking gooey caramel off our fingers from sticky rolls and running around the house following the clues the bunny hid in search of our baskets. These traditions, rooted in the years pre-kids, make me smile. Easter may not be the grand affair of Christmas, but I bask in its quiet simpleness. One day Jillian will join in the Easter morning scavenger hunt, reading clues found in plastic eggs, and dashing off to locate the next one. This year she was propped in a bumbo, reaching for the goodies stuffed to the brim in a basket bought years ago when this now family of five was a mere family of three. Easter afternoon found us surrounded by family at my aunt's farm, bellies bursting with home cooked food and kids caked in mud. Now remnants of the holiday still litter my house--colorful peeps and chocolate bunnies and random plastic eggs--and evidence of the snow storm have all been washed away, save for a few patches of brown-tinted snow found hidden in shady spots. Flowers poke up in the garden overgrown with last year's death. Spring has sprung, and we're ready to transition to the next season.